I love this table because it is well-made, easy to assemble and looks wonderful on my deck. I now own three of them, and my deck looks like a cool alfresco restaurant. 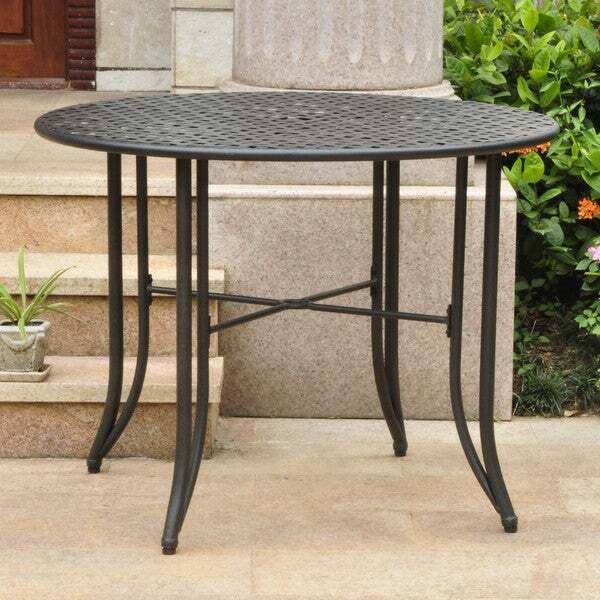 Havenside Home Bethune Round Steel Patio Table - 32.5"
Elevate the look and feel of your outdoor seating area with this elegant dining table. Featuring a classic iron design, this durable, round table fits beautifully into a variety of outdoor settings such as a patio, terrace or yard. Available in four attractive shades, this table promises convenience and comfort in one pleasing package. Dimensions 40.0 In. X 3.0 In. X 40.0 In. Good solid table for the money. This table is well built with all welds secure. Nice finish, I got the hammered bronze. Assembly took a little time but was not difficult for one person to do. An Allen key, supplied with the order, is the only tool you need, This product was a replacement for a wooden table I bought from Overstock but had to return because of poor craftsmanship. Don't order the International Caravan Highland 38-inch Folding Table. When my table arrived it was in a box that described it as being a gaming table and was box 1 of 3. However, it was the right table so I assembled it. Assembly was easy enough. It does have a few imperfections in the basket weave design on the top. The metal strip on a couple of them were sticking up and could be a problem if someone were to run their hand across it. I didn't return it because my husband had already put the box out for the trash. I think it will be okay if we can hammer that piece down where it will be smooth. Also, I was disappointed that the legs are not wide enough to push the chairs in under the table. Other chairs might fit okay but not the ones we have. If that is important to you, I would measure first. I hope this is helpful. Great quality, nice bronze color. This table was simple to construct and fit very nicely with an outdoor umbrella. Held up well in rainy weather without much care needed. Like this table very much. Color is great,size is perfect. Only flaw is we have had it less than two months and there is a place where it is rusted...easy fix, but a little disappointing. Great outdoor patio table. Looks spectacular &amp; adds a high end look to my outdoor space. Love, Love, Love it. Would order it again in a heartbeat. First one sent was damaged in transit, second was lost in transit, and finally I received a good table. Took about 30 minutes to assemble, it's very attractive, and I'm pleased. I'd describe it as light to medium weight for an iron table. Lovely table... sturdy yet has a delicate look due to the intricate weave on top. Easy for one person to put together....all of the holes lined up perfectly. I also purchased a 7.5 umbrella that fits it well. Major feature on my smaller patio. Looks like the packaging suffered a lot during shipping...lots of holes in the cardboard...perhaps inferior packaging materials? This is the perfect table for a small outdoor patio. We use it with four chairs and we have plenty of room. It is nice quality and it doesn't rust. The "lattice-style" top is very pretty. This is a sturdy, easy to assemble table. Looks great in my patio. Received the table in a repackaged box. It looks like a returned item. The metal cross holding the legs damaged the table top becuase they got in the metal net during shipment. The table top with metal net is very rough with sharp edges. You could easily get yourself hurt or even bloodied if you run your hands across. The paint is a cheap thin layer of film and can be easily peeled off. Had to to call customer service to cancel this item. If mine is not an outlier, then this product shouldn't be allowed for sale. My beautiful table that I have in my gazebo to show off to my guests. I always tell them where I got it and happily to do so. Thank you Overstock. Functional, easy to put together. Did have some sharp edges to be filed down. Great table. First one came in damaged but Overstocks prompt customer service sent another ASAP! Table is great for around the pool area... love it. Good quality, but not superior, though the price was right. Some minor denting of the metal and some chipped enamel, but not terrible. Fits nicely on my new deck! Love this table!!!! Really match my metal chairs. Sturdy table, easy assembly. Slight shipping damage but fixable. "Please provide exact dimensions. Height says under 35". Not specific enough. " Dimensions are: 39 inches wide x 39 inches deep x 29 inches high. I hope it helps. "I’ve just had the table delivered while out of town. Interested in previous question regarding the diameter of umbrella hole in table. The only answer I saw was a guess could I please get a definitive answer from seller? Thanks. " The inside dimension of the hole is 1-7/8". It is definitely round! "How many people can sit around the table....do u know the diameter"
"How large is the size of the umbrella hole?" The table top is woven so the opening appears to be square. The frame underneath is round and the opening is 2 inches in diameter. "live in IN, will it hold up if I cover it, with the snow an sleet, will it rust?" Got mine last summer and it's been on the deck ever since. Rain, snow, sleet, and no rust. Held up beautifully. It's a very nice table that you don't see everywhere else. Love it! The style, the color, and the price. Not something you see everywhere. I like the bronze color and the weave of the metal. "inches from table leg to table leg at bottom?" Hello Sjean, the table legs are approximately 24 inches apart from each other. Have a great day. Havenside Home Belvon Steel Indoor/ Outdoor Patio Table - 32.5"